Asset Manager will serve as a repository of Images that you wish to use in your App. In other words, it will act as a storage house for the images. All the static images to be used in the whole App shall be stored here only. It is essential to upload the images with proper naming conventions and all the required resolutions, respectively. There are two ways for doing this – you can either code it in the admin panel OR change the name of the image before uploading on your system (Laptop/PC), before you upload to the Admin panel. In any case, naming conventions needs to be adhered to. You can upload all the images that you need in your app to “ASSET MANAGER”, via zip folder at once. You can either upload the zip or the specific images, as required. The required format for the images is PNG. Every App needs multiple images. In addition, your app will also need icons to represent content in the form of navigation bar, toolbar, tab bar, etc. Refer the below mentioned links for the sizes required for the icons and images. If you are developing an App for Android, you are required to upload all the assets for all the four specific resolutions, respectively. Make sure, the images are resolution specific and according to the naming conventions so that it will capture all the images accordingly. Naming convention is a set of rules that needs to be adhered to, when naming the images. Irrespective of platform for any resolution “icon.png” is must. We have shown this mandatory image by the “star” symbol in the asset manager. This is the main image based on which all the images are grouped together. After providing “icon.png” , we need to provide icon@2x.png, icon@3x.png for respective resolution. Eg: icon@mdpi.png, icon@hdpi.png, icon@xhdpi.png and icon@xxhdpi.png If a particular image is there with all the resolutions in the Asset manager, then that will automatically be taken care of by the device. Photo Editor Lets you edit photos and apply different effects. You can resize, shrink, crop or enhance your image. Configure.IT provides an integrated Image Editor which lets you upload and edit images. You can also choose existing images from the editor to use as and when required. Hovering mouse over the image, will show you different icons using which you can either check image, edit or delete image. It will also display the information like Title, Resolution and Size of that particular image. Edit: You may edit either via tapping the edit icon on the taskbar on image icon or right click on the image icon. Make the desired changes and Save/Apply the effects. Select All: You can select all the records with “Select All” button. Clicking on this button will select all the images in the Assets Manager. Searching: As the App gets bigger, the number of images increases. So you can search for any image by typing its name or beginning letters of the image in search barand the list will get shorter to reflect the same. Number of Images on right side will also reflect the filtered images numbers. Warning / Missing Image Icon: If any image has blue up arrow icon , it indicates all the images require for all the resolutions are uploaded and it's up-to-date. Refer to below screenshot which displays all the images for all the resolutions for iOS. 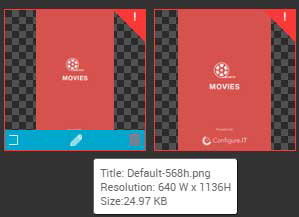 Refer to below screenshot which displays all the images for all the four (4) resolutions for Android. You may notice a warning icon appearing on the image icon as . This warning icon indicates the Missing Images. Click on the warning icon and that will open a popup. Upload an appropriate image for the required resolution and get away from the problem of missing Assets. Click on “Upload” button to upload the image. Once the image is selected, Click on “Start Upload” in the bottom right corner, which will upload all the images at once. This will eventually help you to have images required for different devices, respectively. The number reflecting in the right side in Blue circle with # is the total number of images uploaded in the Asset Manager. Background gives effect to the image. You can switch between the backgrounds from . Select from either White or Black background, based on your requirement. Size is an option that specifies the overall size of an image to display for an object. You have 3 different sizes available to check how your image would look. You can check the view in small, normal or larger mode/version. Downloading specific image or all the images is possible with “Download” option. There are times when you would need the same set of images in your another app/project in the account. You can do it with this and then upload the zip/multiple images, to the source (desired app). This way you can use the same set of the images in multiple Apps. Whether you want to delete a particular resolution specific image or the entire set of an image, the Delete option allows you to delete the image from your app. Reducing the size of your APK/IPA is always recommended. Using this option, it will screen your entire app and filter out the images that you haven’t used anywhere in the app. You may take the backup of the unused images and delete from the app. Thus, do away with the unused images and reduce the size of your app. Duplicate images take a lot of space on the size of the file and to identify and delete them manually is a difficult task. Click on this option and the screen to merge the assets, will open up in a new tab. It lets you find the duplicate image files and you can remove them easily. The number reflecting on the image icon displays the count for the same images. Enable the checkbox to merge and merge the images. You can either all the images in one zip file or maximum 10 images at the same time. Clicking on “Upload” button, will open the Windows Open dialog box. Anytime when you want to come out of Assets Manager and continue on App Configuration, click “Close” button. Will the changes in Image affect already used Image too? Certainly, As you are editing the same image, the changes/effects will also be applicable to the image already used across the app. What if the changes doesn’t reflect? It may happen as sometimes the changes do not reflect and the real size of the file is not displayed due to either browser incompatibility or time taken in processing the image file. The alternative is; you can download the image from asset manager, edit it and then you can upload the same again but with the same "Name". While uploading, it will ask you to "Replace an Existing asset". You must check this check-box. This will replace the old image with the new one that you have edited. If more images are there you can ZIP them and upload it too. Once app is published, Assets folder is stored on Mobile or stored on hosting server? Assets will be stored on device(Mobile) local storage. Is there an efficient way of importing assets so they go into their respective resolutions areas? You can import all the images/assets at once or separate images in the Assets Manager which is a common area to placehold all the icons, PSD & etc. Please download zip file from "Importing PSDs to create screens" on http://www.configure.it/help/reference-manuals.html which will provide you detailed information.